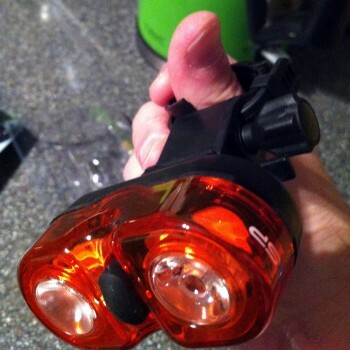 Dark Mornings, Darker Nights, Dangerous Cycling? It’s depressing reading about all the fatal cycling incidents on our roads this time of year. Like most MTB folks, I avoid roads most of the time but, let’s face it, there will be a time when you’re out on the road in the dusk or darkness – especially over the winter months. If you want to avoid becoming a statistic or going home in three plastic bags, the best thing you can do is make sure that you are seen when you’re riding your bike. Decent lights are a vitally important part of this. I’ve never ridden without a rear light and usually don a small flasher on my helmet as well as a seatpost-mounted bigger light, but I recently decided to upgrade the power a little bit. 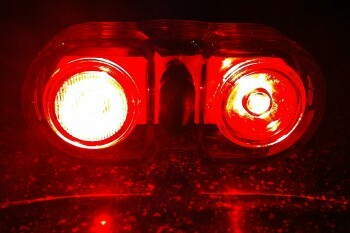 Some searching brought me to the RSP Astrum rear light. 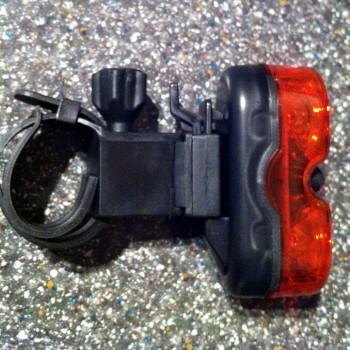 The RSP Astrum is a light made up of two 0.5 Watt red LEDs, which can be left on constant beam or one of two flashing profiles (both lights blinking or alternate). This is done with a big, glove-friendly button right in the middle of the unit: just press it again until it does what you want. Visibility is advertised at “up to 1000 metres”. No doubt this was measured in ideal conditions, but it’s a very bright rear light compared to my previous rear blinkies. One thing I like is that there are two different lenses on the light, one for each LED. One allows the light to shine right through, giving maximum straight-line visibility, while the other has a diffuser and throws the light outwards much more effectively, for getting yourself noticed close-up. The body has a fairly thick rubber gasket to give waterproofing and I have no doubt that it will do its job. 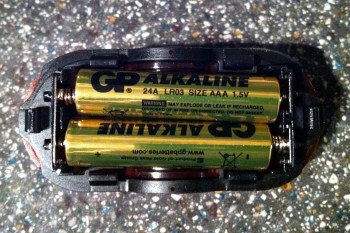 You open it using a coin to twist the two halves apart and put in two AAA batteries which should last you all winter (for most riders). Simple and inexpensive power. The main body parts are fairly thick plastic and look like they will stand up well to being mounted on an MTB which sees some bouncing action. 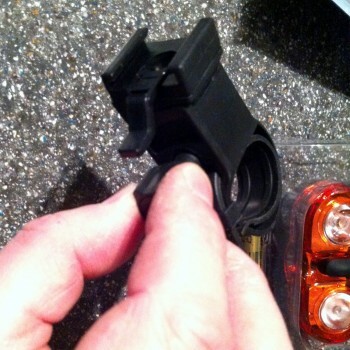 The mount is a fairly simple, chunky plastic click-in-and-out job so I’m going to think about a security zip-tie as I’ve had lights lost on rocky trails before now. If you’re riding on the road, I don’t think this will be an issue for you. There’s an angle to compensate for your seatpost’s lean, so be careful which way up you mount it – it’s not adjustable once it’s fastened. This is a minor thing though, as once it’s on it will shine backwards and will help to stop you being mown down by other road users. So: Should You Get One? 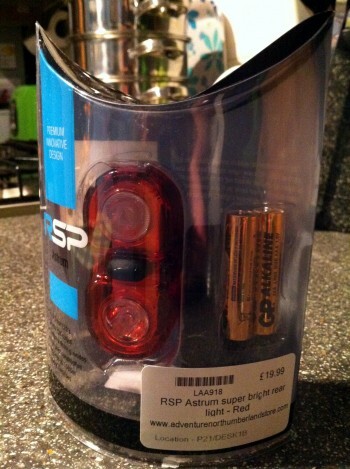 At well under £15 as I’m writing this, the RSP Astrum gives great shine-per-pound value. It looks well designed to cope with UK weather and MTB abuse, so I’m saying yes, you should. If being seen at night is a priority for you, it’s definitely worth a look. There’s a half-decent chance your LBS will stock it, or you can buy it from Amazon like I did.